It is a great pleasure to be back. 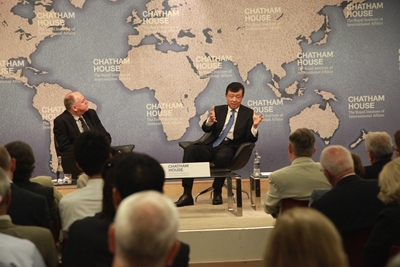 This is my fifth visit to the Chatham House since I began my duty as Chinese Ambassador to the UK. Recently Brexit is the hottest topic at Chatham House. I did not expect such a big turnout for my speech. This shows the importance of the issue of the South China Sea and the necessity for me to share with you where China stands on this issue. With regard to the South China Sea, one issue has been a headline maker recently. That is the arbitration unilaterally initiated by the Philippines. Right after the arbitral tribunal announced its ruling, China made a series of responses. The Chinese Government issued the Statement on China's Territorial Sovereignty and Maritime Rights and Interests in the South China Sea. The Chinese Foreign Ministry issued the Statement on the Award of 12 July 2016 of the Arbitral Tribunal in the South China Sea Arbitration Established at the Request of the Republic of the Philippines. China's State Council Information Office published a white paper entitled "China Adheres to the Position of Settling Through Negotiation the Relevant Disputes Between China and the Philippines in the South China Sea". Chinese leaders and senior officials also made remarks or gave interviews to highlight and interpret the above two statements and the white paper. They reaffirmed China's territorial sovereignty and maritime rights and interests in the South China Sea. They disclosed the nature of the arbitral tribunal which expanded and exceeded its power and abused the arbitration proceedings. They expounded on China's solemn position of not accepting or recognizing the illegal ruling. Today, I want to discuss with you face-to-face about why China believes the ruling is illegal, and why it is null and void. First, the tribunal has no right of jurisdiction. The subject matters unilaterally initiated by the Philippines for arbitration, and the real intention behind it, is in essence related to territorial sovereignty and maritime delimitation. Issues of territorial sovereignty are clearly beyond the scope of the UN Convention on the Law of the Sea (UNCLOS). And issues of maritime delimitation have been excluded by the declaration that China made years ago in accordance with UNCLOS. From the very beginning, the tribunal expanded and abused its power recklessly to areas outside of its jurisdiction. How could a tribunal thus established go ahead to ensure procedural and substantive justice? Second, the arbitral proceedings are against the rules of UNCLOS. According to the dispute settlement mechanism of the Convention, bilateral channel between state parties comes before arbitration. The third party settlement will be applied only when bilateral means have been exhausted. China and the Philippines have long agreed to resolve relevant disputes through bilateral consultations and negotiations. The two countries have never had any bilateral communication over the filing of the arbitration. On what basis did the tribunal conclude that bilateral means have been exhausted? However, the tribunal disregarded the fact that none of the pre-conditions for starting the arbitration had been met and forced ahead with the case. Such a procedure is utterly unreasonable and unusual. It contravenes the general practice of international arbitration under the Convention. Hence, the proceeding of the arbitration is illegal. And as it is to everyone's knowledge, procedural justice is the pre-condition and foundation for substantive justice. Third, the arbitration ruling is an aberration from the fundamental purposes of the Convention. The Convention is aimed to settle disputes and differences in a reasonable and equitable way. But the tribunal's practice, overtly biased and politically motivated, went the opposite way. The tribunal accepted every illegal claim made by the Philippines while all of China's reasonable concerns were rejected. To save the Philippines from breaching of its own commitment to bilateral negotiations, the tribunal belittled and nullified the Declaration on the Conduct of Parties in the South China Sea (DOC) as well as a series of bilateral agreements reached between China and the Philippines. To maximize its denial of China's legitimate rights, the tribunal even shrank the Taiping Island into a rock. This indeed reminds me of a Chinese idiom: Calling a stag a horse. This idiom tells a story of a high-handed prime minister during the Qin Dynasty who exceeded and abused his power. But that was a story over 2,000 years ago. Today, in the 21st century, it is inconceivable that the arbitral tribunal could relive the same story. Two thousand years ago, by the order of a prime minister, a stag could be deliberately called a horse. Today, at the hands of the tribunal, an island suddenly becomes a rock. Time has changed. But the tribunal is playing exactly the same trick and its motive is just as hidden from the broad daylight. The obvious bias of the tribunal has solved no problem or dispute. Rather, it created problems and intensified disputes. The arbitration thus has no substantive justice. The arbitration is therefore illegal in jurisdictional, procedural or substantive terms. So, from the very beginning, it has been nothing but an illegal political farce. It was not surprising when some prestigious jurist concluded that the ruling "will be widely regarded as the fruit of a poisonous tree, and it will fail, therefore, to garner the necessary support." To those who insist on regarding the ruling as a "treasure", I would say that this ruling created nothing but a costly "hallucination". The excitement from the ruling may last a while but what follows would be endless suffering. China is firmly opposed to the arbitration and its ruling, and will stick to its consistent policy. The arbitration has zero possibility to become a "watershed" in the developments in the South China Sea. Nor will it be allowed to disturb the overall peace and stability the region now enjoys. First, the arbitration ruling will by no means affect China's territorial sovereignty and maritime rights and interests in the South China Sea. In international law, the principle "ex injuria jus non oritur," says that illegal acts cannot create legal effect. The illegal ruling is nothing but waste paper, not only to China, but to any party concerned. China will not accept any third-party dispute settlement that does not have China's prior consent. Nor will we let others impose solutions on us. Second, the arbitration ruling will by no means affect China's commitment to peaceful solution through bilateral negotiations and consultations. I wrote an article on this subject. As its title says, China is not motivated to rule the South China Sea. China has always been committed to settling disputes through peaceful consultation and negotiation with countries directly concerned based on respecting historical facts and international law. China calls on all parties to exercise self-restraint in the process of resolving disputes, and refrain from taking actions that will magnify or complicate the disputes. Pending an ultimate settlement of the disputes, China supports the making of a temporary and transitional arrangement, agreed by all relevant parties based on mutual understanding and the spirit of cooperation. China has all along called for "shelving differences and engaging in joint development". This commitment has not changed and will not change. China stays committed to negotiation with the Philippines for dispute resolution and improvement of bilateral relations. This hasn't been changed by the arbitration. The arbitration unilaterally initiated by the former Philippine government has caused damage to China-Philippines relations. But the Philippines is one of China's close neighbours. We therefore hope the new Philippine government will consider the overall interests of China-Philippine relations and the common interests of both countries. We hope it will come back to the track of dialogue and consultations. The momentum of cooperation between China and ASEAN has not been changed by the arbitration, either. This year marks the 25th anniversary of the dialogue partnership between China and ASEAN. The two sides will co-host a special commemorative summit in September. This will be an opportunity to outline the future cooperation strategy for closer unity and greater benefit for the peoples of both sides. With regard to the South China Sea issue, China is always ready to engage in friendly and candid communications with ASEAN countries. China will comprehensively and effectively implement the DOC and steadily advance the consultation of the Code of Conduct in the South China Sea. China will follow the "dual track approach". This means the relevant disputes shall be settled properly by countries directly concerned through friendly consultations and negotiations, while peace and stability of the South China Sea shall be jointly maintained by China and ASEAN countries. At the same time, the Parties encourage other countries to respect the principles contained in the DOC. Third, the arbitration ruling will by no means affect China's commitment to peaceful development. China has long been working to build, uphold and contribute to international law and the international order. China's sovereignty and maritime rights and interests in the South China Sea are in fact part of the international order established after the Second World War. China's relevant claims have never exceeded the scope of the current international order. In this sense, China's rejection of the arbitration is to uphold the post-war international order. It is to prevent the Convention from being politically hijacked. It is to protect the authoritativeness and the integrity of international law, including the Convention. Since the founding of the People's Republic of China in 1949, we have signed boundary treaties with 12 of our 14 land neighbours through consultation and negotiation. We have completed maritime delimitation with Vietnam, also through consultation and negotiation. These powerful examples demonstrate that China abides by international law, upholds international order and works for regional peace and stability. The South China Sea is an important shipping lane. It bears the interests of many countries, including that of China. Therefore we understand the international concerns over the South China Sea issue. We have never rejected the legitimate rights and interests of non-regional countries. We are always committed to safeguarding the freedom of navigation in the South China Sea. However, we are opposed to certain countries' "gunboat policy" under the pretext of "protecting the freedom of navigation and overflight" and "maintaining regional peace". We are opposed to them taking advantage of the arbitration to hype up or create tensions in the South China Sea. The South China Sea must not become an arena for some big power from outside the region to flex their muscles. The Chinese people are firmly determined to protect our national sovereignty and maritime rights and interests and our determination will not be swayed by threats or intimidation. Let no fleeting clouds block our vision. Let the right way lead us on. The South China Sea issue is left over from the history. At the same time it concerns real interests of today. There is also geopolitics involved. Resolving this issue will take time, patience and the mutual understanding and respect between countries concerned. For a solution to be fundamental and enduring, it has to be peaceful, it has to go through equal-footed consultation and negotiation between countries directly concerned, it has to be based on respecting historical facts and international law. The South China Sea should be a sea of peace, a sea of friendship and a sea of cooperation. This is China's commitment. And it takes the joint efforts of China and its neighbours to turn this into reality. On 25 July 2016, H.E. 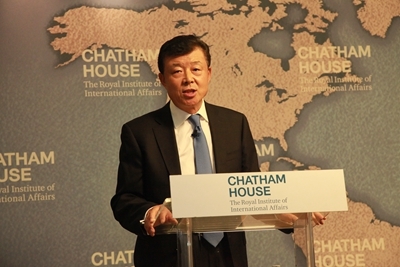 Ambassador Liu Xiaoming delivered a speech entitled "Let no fleeting clouds block our vision" at Chatham House at the latter's invitation. He expounded on China's position on the South China Sea arbitration and China's policy initiatives on the South China Sea issue. 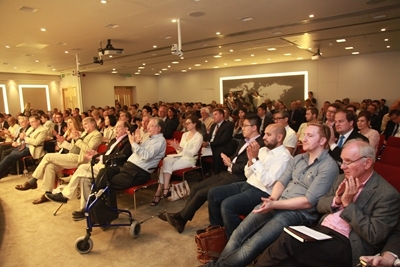 Present at the event were over 300 people from political, business, academic and diplomatic circles of the UK as well as major media organizations. Following the speech, Ambassador Liu answered questions from the audience on issues including the impact of the US presidential election on China-US relations, the nature of the South China Sea arbitration, the legal status of the dotted line in the South China Sea, negotiation on the Code of Conduct in the South China Sea, China's construction on its islands and reefs, resource development in the South China Sea, the impact of the arbitration on China's relationship with neighboring countries, disputes between China and Japan over the Diaoyu Islands, trends in China's diplomacy, etc. 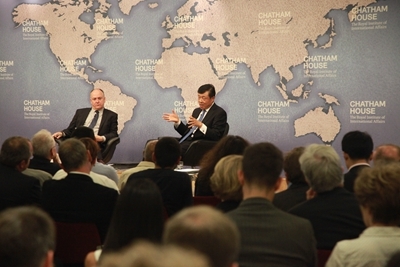 Founded in 1920, Chatham House, the Royal Institute of International Affairs, is one of the largest research institute on international affairs in the UK, boasting of a high-level research team and enjoying prestigious reputation in international studies in the UK and worldwide. With more than 3,000 members and close connections with the British government, business, media and academia, it has considerable influence on foreign policy making of the British government. Its research mainly focuses on international strategies, international relations and foreign policies. Important publications include International Affairs and The World Today.